A RUP LIFE: July Ipsy! 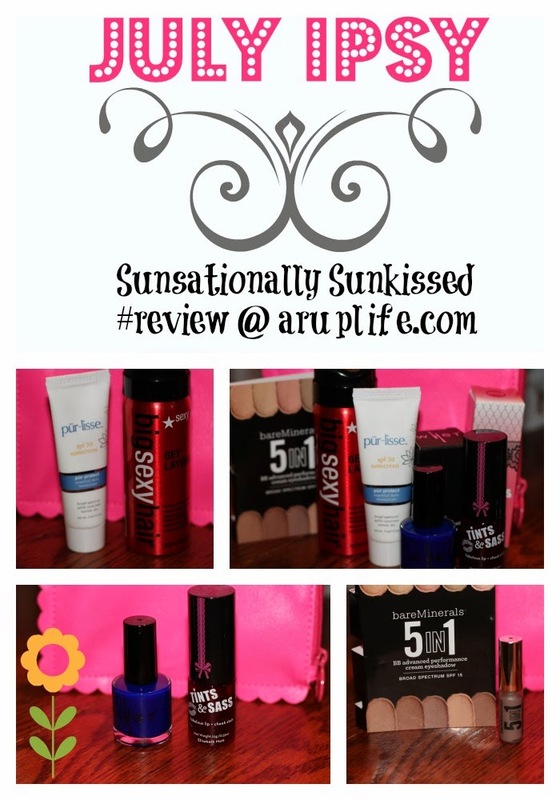 July's Ipsy theme was Sensationally Sunkissed. I think that was not the best theme considering nothing in my bag was 'sunkissed' themed except maybe the hot pink bag. I was pleased to see 5 products but I think only the Tint was fullsized which was disappointing. Well I'm glad I wrote this review up. The Pur~lisse looks exactly like the moisturizer they sent a few months back. However I'm so pleased to see it is actually a sunscreen. I like the sample size of that for travel. Nice! The only thing I'm really disappointed in is the size of the bareMinerals cream shadow. It is tiny. Like really tiny! Overall I'm happy with the bag. For $10 it was a nice mix of skin, hair and makeup. Makeup being my favorite stuff to try. Are you a Ipsy subscriber? Remember Ipsy is a subscription service that gives you a beauty bag once a month. You don't get to pick your products but they do have you fill out a questionnaire to try to match you with products you will like. The service is just $10 flat a month (shipping included). A little tip - you will go on a waiting list if you sign up. Be sure to share on the social media (facebook share is what I did) and you should get fast tracked to get the next mailing. They always bill on the 1st of the month and ship around the 15th. Ipsy is a subscription service. The bill on the 1st of every month and ship around the 15th. You can join here. *Ipsy did not send me this subscription. I pay for it monthly and share with you the products. By signing up under my links you do earn me points which I can use for a upgraded product. Thanks!